We were excited to head to Victoria for one of our favourite conventions, Gottacon! Gottacon is dedicated to bringing together gaming geeks of all sorts. 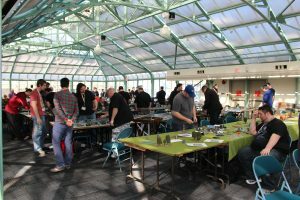 This con focuses on being an inclusive gaming experience with a broad spectrum of games: from RPG and table, to miniatures, trading card games, LAN games, and more. Gottacon also offers a variety of panels, workshops, and special events. 2015 was Gottacon’s seventh year in existence and our second year in attendance, and we definitely had a blast! Our friends Deanna and Ethan from Guardians of the Geek were able to come with us, so it was great to be able to share this awesome convention with them! We will be reviewing games we played in future posts, but join us as we recap the weekend! Playing Lords of Vegas on the ferry to Gottacon. 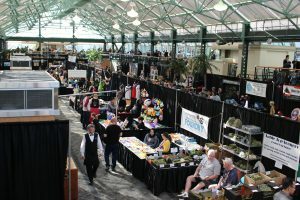 This year the convention expanded to two locations: the Victoria Conference Centre (inside the Empress Hotel) and the Crystal Gardens (technically part of the VCC, but across the street). This year’s attendence was expected to be 4,000, so an increased size in venue was to be expected! 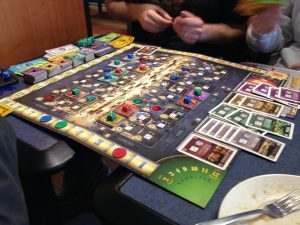 We were fortunate to have local game store Pastime Sports & Games sponsor our trip to Gottacon this year. So on Friday we got early entrance to the vendors hall in order to setup the booth. Overall we all had a lot of fun manning the booth; we got to talk games with other gamers, share in laughs with other vendors, and overall got a vendor’s look into conventions. My favourite part was how excited folks got when they spotted an out-of-print RPG book they had been looking for. After that the con kicked off, and we had the chance to explore everything it had to offer. The Crystal Gardens building is where we all spent most of our time, as it featured all of the board games, indie games, miniatures gaming, and the vendors hall. 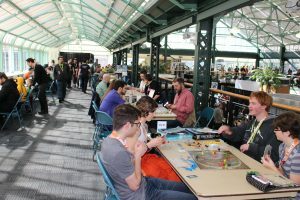 The main convention centre hosted the video games, RPG games, panel rooms and theatre, and the collectable card games. After a tasty breakfast, we headed out for day two! I caught the Creating a Hook 101 workshop, which looked at creating interesting stories as a GM that hooked players into it. In my experience as a GM for an online RPG, I know how frustrating it can be to come up with exciting hooks only to have half the players think it’s fun and the other half give it a sad trombone. Tips I picked up include 1- Have a question players need to answer, 2- Create mini-interludes that you can slip in whenever the game slows down, being sure to tie them back to major plot points, 3-When players make a joke suggestion, threaten to use them… or actually use them (also called chumming the dungeon), and 4- Make sure to have smaller scale hooks, so that the bigger ones have more meaning. Saturday also featured the annual Gamer Silent Auction. Gottacon debuted a new app for this, that included tracking of items, bidding, and notifications if you’d been outbid. If you didn’t have a phone, computers were available to register bids. I found this so much better than the previous, paper system. Last year I couldn’t get in to the auction room to place a final bid because people were stalking the tables to make sure their bids won. My only negative feedback about the app was that it didn’t show you if you had the highest bid on an item; it only notified you if you were outbid. So if you wanted to login and check on other items, there was no way to tell if you had the high bid until you were notified. I also heard a few complaints from other participants (apparently the system crashed preventing people to place final bids, but I didn’t experience this). I hope they keep the app for the auction next year, but work to improve it based on feedback, because the benefits that I got out of the app definitely outweighed the negatives. Learning Star Trek Attack Wing. Blair and I were able to learn how to play Star Trek Attack Wing from a seasoned pro. It’s one of those games that you can take seriously, getting to know all the cards, bonuses, etc etc, or just play for fun. Blair got really hooked into the game. I enjoy it, particularly because I’m a Trekkie. Also, they have the Enterprise, NX-01! 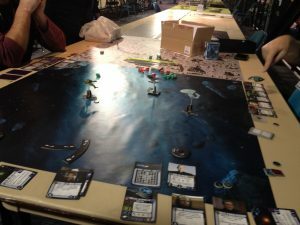 This is a great game for two players, because you can each have one ship or you can have more, and the strategy every time you play it will be different. I have to admit, I was disappointed in the amount of attention paid to video games this year. It felt as though video games were front and centre at the convention and even in all the promo leading up to the event, while all the other types of gaming felt pushed to the side. I understand the want and need to chase sponsors and keep them happy, but it would still be nice to give a bit more balanced promotion to other events. All in all we loved this convention, and can’t wait for next year!